Colin and Lauren enjoyed Halloween this year with some special guests. This year they went trick-or-treating with their friend Evan, his sister Jillian and their cousin Kayla. 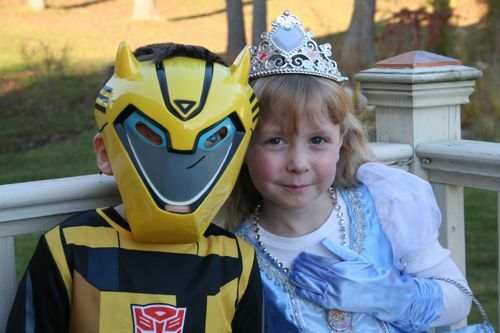 Colin trick-or-treated as a transformer while Lauren was dressed up as a beautiful princess. We went trick-or-treating from house to house around our neighborhood and ended up with baskets filled with candy. Afterwards the kids sat around in delight counting their candy and of course eating a few. While the adults enjoyed apple pie and coffee.